Here in the North Atlantic, spring, of obvious reasons, arrives a little later than on the European continent. So no wonder that we look forward to springtime and are quite aware of its arrival. Even though February 22nd, from days of old has been considered as the first day of spring, we have to go further ahead on the calendar, before the signs start to show. By St. Gregor's Day on March 12th the Oyster Catcher, the Faroese national bird, return to the islands, and at Spring Equinox, on March 21st, we really feel that spring has arrived. It is about one month later that the greatest and most valued signs of spring appears. Everybody, grown ups and children, are looking forward to the event. We observe the meadows wistfully, especially where we know that the first tends to show up. There is a certain impatience about this waiting, and if it occurs sooner than expected, it may even be mentioned on the radio. And then suddenly it is there - the first lamb. A tiny little lump of wool with large eyes and ears – and like most baby animals, the cutest little thing you'll ever see. Seeing the first lamb has a strange effect on people. We tell others about it, what color it is and where we saw it. People passing, stop to see the little creature and the sight can bring a smile to even the most weather-beaten face. Later, more lambs will appear, and it is a real pleasure to see them play and romp in the meadow. They jump around, gore and climb on the boulders which are everywhere in the Faroe Islands. The Faroese do not breed sheep for their wool, and therefore the little lambs come in all colours. White, black, gray and brown are the most common - and often multicoloured, depending on origin. It happens that the mother sheep, for some reason, does not want to stay with her lamb, and leaves it. These lambs are taken to the owner's house and fed up with milk. You often see these so-called "heimalomb" (lambs that are raised at home) outside the houses in the early summer months. Some of them become so domesticated that they most of all resemble a puppy. They are obviously the children's favorites, and it is not always without certain amount of battle and crying, if such a lamb is chosen to slaughter in the autumn. The lambs stay with their mother over the summer. They suckle for some months and otherwise follow the mother to summer grazing in the mountains. Sheep are territorial animals and stay mostly within certain preferred areas. This property is inherited from the mother to the lambs, which since will to prefer the same grazing areas. 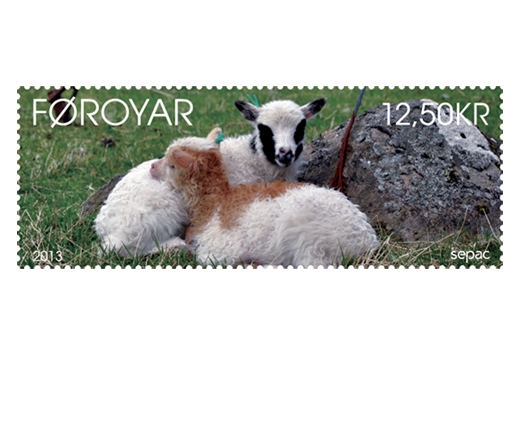 The Faroese sheep is categorized as "primitive" race, since they are not bred as the so-called race-sheep. They are more robust and agile and are doing quite well on their own, even in inaccessible mountain areas where cultivated sheep breeds would quickly succumb. The wool is thick and not so curly and has a layer of rough, water repellent outer hair, which makes it suitable for knitting of the so-called Faroese sweaters, designed for outdoor use in all weather. The fine inner wool is used for finer processes, and in recent decades a very refined design culture has emerged for clothing knitted by Faroese wool. The lambs grow large during the summer, and go in the outback until slaughter time in October. The fact that the sheep are driven directly from the outback to slaughter, makes the meat of a very special quality, which is not found in sheep on cultivated pastures. The wild herbs, which are a part of the diet, give the meat a very fine taste, and the fact that the lambs move around in the mountains gives a very solid and lean meat. But all the talk about wool and meat are not the first thing in our mind, when we are all longing for spring, small lively hairballs and bleating of baby lambs. The most powerful sign of springtime.